MinecraftEDU is a special, "modded" version of Minecraft which we purchased in November 2013 to use in our STEM classes at IES. 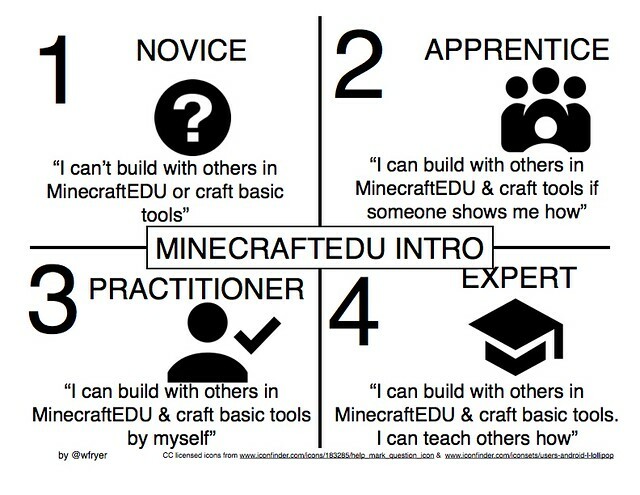 More information about MinecraftEDU lessons is available. We are using the "Group Building Areas" (Eco Junction) MinecraftEDU world for this challenge. Practice respectful collaboration building with a partner in MinecraftEDU. Follow visual instructions (recipes) to craft basic Minecraft tools. Work as a team to build a farm that can support the food needs of your group, using a single water source. Choose the SAME numbered area to work together with members of your group! Participants enter the water challenge with only a place to rest and a fountain of water that pours into a small ditch. While they may collect water in buckets and transfer it manually, participants are faced with few food sources and will need to collaborate to establish a network of water flow. They are challenged to plan and develop a functioning settlement around a single water supply. Through collaborative building participants practice problem-solving and system thinking and apply understanding of real world phenomenon such as water flow to a simulated environment. Open a chest containing bread and give it to the NPC. Open a chest containing 3 wheat. Use the crafting table to create bread and give it to the NPC. This chest contains bone meal. Use the bone meal on existing crops to grow them into harvestable wheat. This chest contains seeds and bone meal. Plant the seeds by right-clicking on farmland. This chest also contains a hoe. Before seeds can be planted, use the hoe to create farmland from dirt. This chest contains wooden planks and sticks instead of a hoe. Use the crafting table to make your own tool, then complete the entire process. In MinecraftEDU mode in the Island Challenge world, build a bridge to transport 2 cows from 1 island to another. In MinecraftEDU mode in the Coordinate Hunt world, try and find as many of the 40 hidden objects in the world as you can. In CREATIVE MODE, build a house and other structures collaboratively with others on your team. Check out other Minecraft and MinecraftEDU builds and ideas in this YouTube playlist.